ASHIWAJU MEDIA: RE-SENATOR DR VICTOR CONGRATULATES SIR AND LADY NNAMDI OKWUONU FOR CHURCH BUILDING. RE-SENATOR DR VICTOR CONGRATULATES SIR AND LADY NNAMDI OKWUONU FOR CHURCH BUILDING. 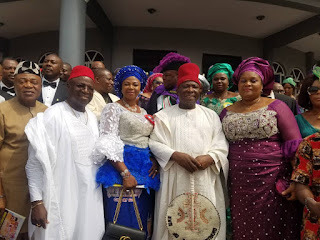 The distinguished Senator representing the good people of Anambra Central Senatorial District, most distinguished Senator Dr Victor Umeh OFR (Ohamadike Ndigbo) and wife Chief Lady Prisca Umeh (Osodieme) today Sunday December 9, 2018 attended the church dedication ceremony of St. Thomas Catholic Parish, Uke. Ohamadike in his congratulatory message said Chief Nnamdi Okwuonu had secured for himself and family a place of Honour in the sight of God for building a church. "My dear brother Chief Nnamdi Okwuonu (Kwocha n'Uke), I am here to congratulate you on this auspicious occasion of dedicating this Edifice, St. Thomas Catholic Church, Nkwelle, Uke, which you alone built for your Catholic Community to the Glory of God Almighty"
"For building a place of worship for God, you have secured for yourself and your Generations yet to come a place of Honor in the sight of the Lord! It is a lasting legacy which will outlive you and spur other good Spirited Philanthropists, especially the younger Generations to always use their God given wealth for the growth of the Church"
Senator Dr Victor Umeh OFR on behalf of his family and the people of Anambra Central Senatorial District rejoiced with and prayed God to continue to bless Chief Okwuonu and family with His Choicest blessings as he works in the Vineyard of the Lord. Now, Ndi Anambra Central, we need to support the reelection of Senator Dr Victor Umeh OFR for Senate come 2019. Ohamadike is bold, strong, courageous and reliable in giving us the much required quality and effective representation at the Senate. Let his good works continue by voting APGA! GOC INAUGURATES GENERAL COURT MARTIAL IN ENUGU.